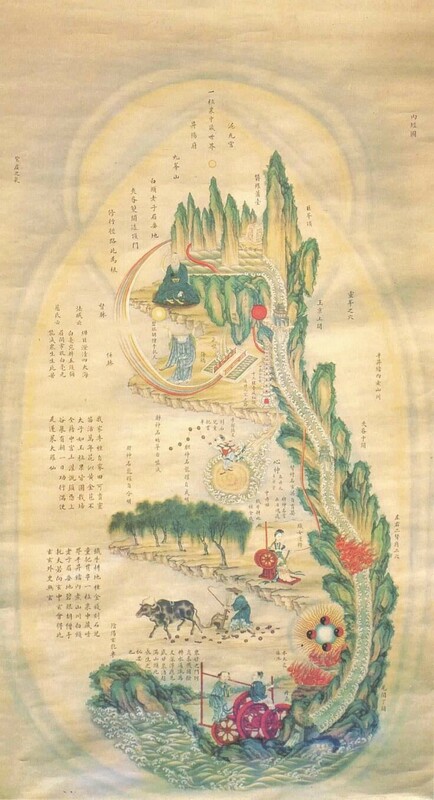 Neijing Tu, also Nei Jing Tu, is a 19th Century chart which alchemists use to illustrate energetic flows for use in nei dan practices, illustrating principles of nei dan, Chinese astrology, and cosmology. Associated with Xiujing Tu, the chart a read from the bottom up. Neijing Tu describes the inner body, while Xiuzhen Tu describes the external cosmology, including the lunar phases and internal organs as represented by associated animals. The diagram show a human body in either meditative or fetal position, and uses cosmological and geographical icons to illustrate staged functions, and refinement of energy as it moves around key parts of the body.